contact me: beautydivaindia@yahoo.com & www.facebook.com/beautydiva.india. Powered by Blogger. Make your skin 4 times* fairer, instantly! Mumbai ’13: In today’s time you are under constant scrutiny, right from head to toe. While you invest immense time in getting a flawless face, don’t miss out on giving your body skin the utmost attention it needs. With the onset of summers, a lot of people shy away from stepping out in the sun due to the fear of tanning and skin darkening. Shy no more, as Vaseline equips you with the confidence of the new Vaseline Healthy White Lightening Lotion that comes with a breakthrough skin lightening technology, which makes your skin 4 times* fairer instantly. New Vaseline Healthy White Lightening Lotion is infused with Skin illuminating minerals, Vitamin B3 and Yogurt serum that go into different layers of epidermis to help re-lighten darkened skin cells, making your skin 4 times* fairer and even-toned instantly. Exposure to the sun interrupts the skin’s natural lightening processes. The pigment producing cells become increasingly active, thereby tanning the skin and leaving it several shades darker. When the skin is healthy and cared for, it has the natural ability to maintain a light tone and clear texture. 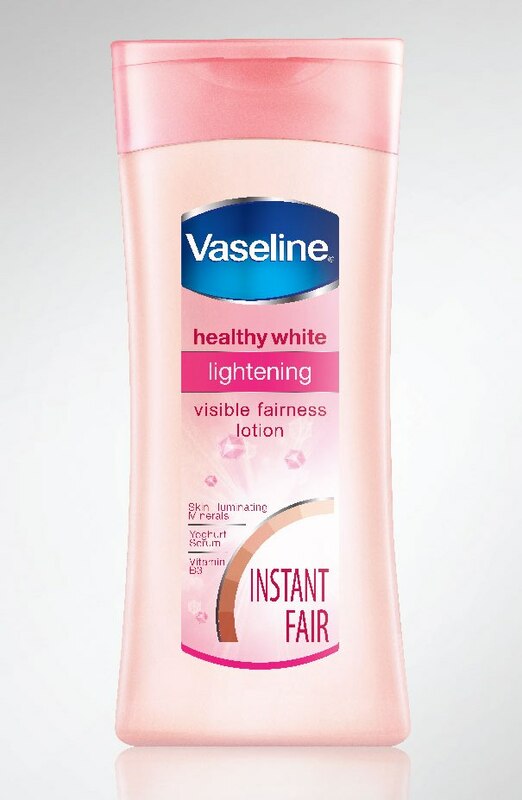 Hence, the Advanced Optics Technology used in Vaseline Healthy White Lightening Lotion provides an instant visual benefit from depositing pigments (Titanium dioxide and Red Iron Oxide) for a lighter, more even toned skin appearance; when combined with skin lightening lotion, it effectively takes care of the top, core and within the epidermis leaving it lighter and 4 times* fairer instantly. Healthy White Lightening Lotion also contains Triple sunscreens that protect your skin from darkening. For best results, use Vaseline Healthy White Lightening Lotion every day and notice the difference as it makes your skin 4 times* fairer, instantly from the moment you apply. So get ready to get that instant and long lasting glow, which will keep the compliments coming your way. Also available, Vaseline Healthy White SPF 24 which helps keep you fair and even toned under the sun. The Vaseline® journey started in 1859, with Petroleum Jelly being its first discovery. Today, Vaseline® products are available in over 60 countries across the world. Its rich heritage, healing qualities and efficacy have been passed on from generation to generation for over 130 years. About Hindustan Unilever Limited: Hindustan Unilever Limited (HUL) is India's largest Fast Moving Consumer Goods company, touching the lives of two out of three Indians. HUL's mission is to "add vitality to life" through its presence in over 20 distinct categories in Home & Personal Care Products and Foods & Beverages. The company meets every day needs for nutrition, hygiene and personal care with brands that help people feel good, look good and get more out of life.